"You won't chase us away like you did Tesla"
"Since the beginning of 2013, academics have not been paid for material costs and thus are left without basic resources for scientific research and equipment maintenance. In the government's plan for rebalancing the budget, it is planned to reduce the budget for science, which means that the present catastrophic situation will get worse and that is why this protest is necessary, " says Dr. Djurdica Jovovic, president of the Union of Science, Scientific Advisor at the Institute for Medical Research. One of the organizers of the SAVE-THE-SCIENCE protest, Dr. Milovan Suvakov, a Fellow at the Institute for Physics clarifies: "The basic point is that the funding planned in 2013, equals app. 200$ per researcher per year which is below necessary minimum for the sustainability of scientific work in Serbia. The fact that we receive salaries does not mean that we are scientists, we are scientists the moment we are enabled to work, and when we become a driving force of this society". 1. To return the amount of funding (so called "material expenses") per researcher for fiscal year 2013 to 50% of the level it was at in fiscal year 2010, and in fiscal year 2014 to return it to the 100% of 2010's level. 2. To increase the budgetary allocation to 1% of the GDP, in accord with the Strategy of Scientific and Technological Development of the Republic of Serbia and recommendation of European Union. 3. To adopt a collective agreement that will regulate the working and legal status of employees in scientific and research organizations, according to the Labour Law, so as to stop the discrimination against researchers from scientific institutes in comparison with other employees in the public sector. 4. To stop unwarranted delays of payment of salaries and the material expenses, and to accelerate adopting necessary new legal acts. 5. To adopt a law, before the end of 2013, that will introduce a new organizational model for the financing of science, according to widely adopted European solutions. 6. Resignation of Minister Zarko Obradovic and others responsible for ignoring and not solving the problems in Serbian science. 7. Urgent meeting with Prime Minister Ivica Dacic and Deputy Prime Minister Aleksandar Vucic in order to adopt and conduct necessary procedures for the survival of science in Serbia. These requests were discussed at the meeting held in the Ministry of Science, Education and Technological Development on the same day, where the minister, Mr. Obradovic, met with the representatives of the Union of Science. The official response of the Ministry was issued on Friday, July 5th and is more than disappointing to all the protesting scientists. The Ministry replied only in very vague terms deemed by the scientists as lacking guarantees, timelines and organized planning. This caused the Union of Science to announce the prolongation of the SAVE-THE-SCIENCE protest with the main request to raise the R&D funding per researcher. 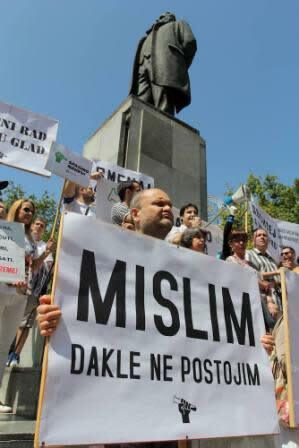 The main message of all the protesters is summed up in the words of Dr. Tijana Prodanovic, associate professor of astrophysics: "Science in Serbia is in a generally bad shape not only because of the lack of funds and basic work conditions, but because it has been chronically neglected for years and years, which culminated in termination of the ministry of science (that has been adjoined with Ministry of Education in 2011). As a result we are left with a scientific community where the entire value system is distorted, where science is done to collect points which impact our salaries and not for the discovery itself, and where any attempt to do any kind of science is made that much more difficult by the fact that we don't even have basic things like access to scientific journals. 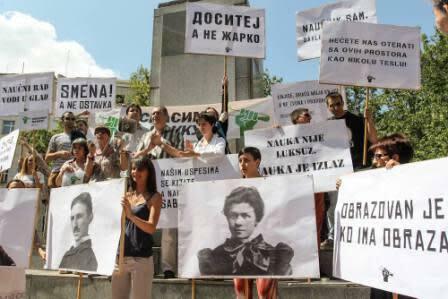 Hopefully this protest is the first step towards the complete restructuring of the science in Serbia." One of the most well-known Serbian scientists and a leading stem-cell researcher, Dr. Miodrag Stojkovic commented on the whole situation: "It is a shame that goverment allows such conditions for the scientists who deserved better treatment and support and should be working at the bench instead of having to go to the street and fight for their rights." More activities are planned for Wed, July 10th. Photos:Tamara ?etkovi? and Bojan Dzodan and authors at Spasimo Nauku Facebook page. Logo: Nune Popovi? &Tamara ?etkovi?